Our team of expert medical practitioners and technicians provide a group of treatment options used for couples with infertility that cannot be treated using simpler methods. These procedures have excellent success rates but require significant effort and can be expensive. For all of these reasons, advanced treatment options can be stressful. These natural stresses can be minimized if you understand the nuances of the various procedures. We encourage you to learn more, freely ask questions of our medical team. Understanding the applications for each procedure will help you obtain the appropriate treatment and maximize your chance for success. There are a number of different types of treatments encompassed under the Reproductive Medicine umbrella. The main treatment is IVF. For some situations or conditions,such as tubal factor, IVF may be the first-line treatment. In other cases, IVF is recommended only if simpler treatment fails. Below is a list of common indications for IVF treatment. One of the most dramatic advances in the treatment of infertility has been the capacity to obtain fertilization and pregnancy in the IVF lab with severely abnormal sperm samples by utilizing ICSI (Intracytoplasmic Sperm Injection). ICSI is often recommended if there is any suggestion of a sperm problem, if sperm are obtained surgically, or if there has been a prior failure of fertilization. Endometriosis may be effectively treated with a combination of surgical and medical therapy. IVF is very effective as a second line of treatment if the initial treatment is proven unsuccessful. In normal reproductive life, a woman’s ovarian function is diminished with age. 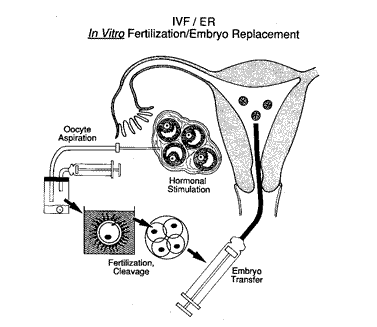 In many cases, this reduced function can be overcome through the use of IVF alone or in conjunction with techniques such as Assisted Hatching and ICSI. The majority of patients with anovulation will conceive using simpler treatments. However, those patients requiring IVF are typically “high responders” to gonadotropin therapy and have a good prognosis. Approximately 20% of couples will have no identifiable cause of infertility after completing a comprehensive evaluation. IVF is often successful even if more conservative treatments have failed, especially since some of these couples actually have some block to fertilization. Genetic testing on pre-implantation embryos may be indicated for patients who are at risk for genetic disorders such as Cystic fibrosis and Thalassemia and for patients with infertility related to chromosomal abnormalities such as recurrent pregnancy loss or repeated unsuccessful IVF. Hormone injections are given to stimulate multiple egg production rather than the single egg normally produced by the body each month. This stimulation process usually requires the initial use of Lupron to suppress the ovary to prevent ovulation until the desired time. Daily gonadotropin injections are then added to stimulate the development of the eggs. These are usually given subcutaneously (under the skin) and are much less uncomfortable than the previous generations of medication. We then monitor the progress of ovulation induction with ultrasounds and blood estrogen levels over several days. On day two or three after fertilization, the embryos will be evaluated for blastocyst culture. If there is a sufficient number of dividing embryos they will be placed in special blastocyst media and grown for two or three additional days.The eggs will be checked the following day to document fertilization and again the next day to evaluate for early cell division. They are now called embryos and are placed in a solution called media to promote growth. Until recently, embryos were cultured for three days and then transferred to the uterus and/or cryopreserved (frozen). We now have the ability to grow the embryos for five or six days until they reach the blastocyst stage. For some couples these blastocysts may have a greater chance of implantation, allowing us to transfer fewer embryos, in some cases only one, and lower the risk of multiple birth while increasing the chance of pregnancy. Embryos may be transferred on day 3, 5, or 6 after egg retrieval. Transfers on day 5 or 6 are called Blastocyst Transfers. They are placed through the cervix into the uterine cavity using a small, soft catheter. This procedure usually requires no anaesthesia. It is similar to the Mock Embryo Transfer which will be performed prior to the actual IVF cycle. Two weeks after the embryo transfer you will return to our office for a pregnancy test. If you are pregnant, we will follow your progress with blood work and ultrasounds for four weeks before referring you back your to obstetrician for continued care. You should expect a normal pregnancy, unless advised otherwise.